You can request your password by email. Display current shopping cart in payment page of PayPal. Reinstwasserfilterharz, wird speziell zum Nachschalten bei Osmoseanlagen verwendet, um Restsalze wie Silicat SIO4 zu adsorbieren. 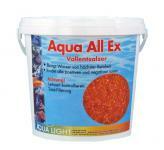 Aqua All Ex von AquaLight bindet alle positiven und negativen Ionen und bringt Wasser in höchster Reinheit. The aquaristic.net sulfur balls for nitrate filters are suitable for all sulfur nitrate filter. The grain size of the balls is 3-4 mm.